« Remembering Lidia and Jan Kazimierski. April 7th. The train left Belsen yesterday, with at least one orphaned child. 1945. 2010~The Year of the Liberator~Early April 1945:American troops inspect the site of the Gardelegen atrocity. April 13, 1945: Death marchers from the small labor camp of Rottleberode, a subcamp of Dora-Mittelbau, are driven to the outskirts of Gardelegen, Germany, which they had reached two days before. 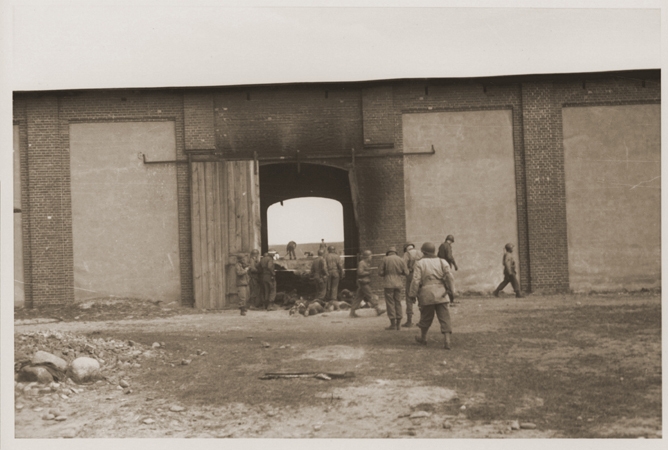 The just over 1000 prisoners are herded by SS guards and members of the local militia into a barn, which has been prepared as an execution site. As the last prisoners are pushed into the barn, the SS guards throw torches onto the gasoline-soaked straw and lock the doors. Those prisoners who are not killed by the smoke and fire are shot by the SS as they try to escape. Only a few of the prisoners survive. April 9, 1945: The concentration camp at Dora-Mittelbau, Germany, is liberated by the U.S. Army. Very few inmates remain alive. April 10, 1945: SS functionary Adolf Eichmann visits the Theresienstadt, Czechoslovakia, camp/ghetto to gloat over the many Jews who have perished there. April 11, 1945: American troops liberate the concentration camp at Buchenwald, Germany; 21,000 inmates are still alive. In the Pathology Block (Block 2), GIs discover tanned and tattooed human skin. April 11, 1945: The U.S. Infantry and 3rd Armored divisions liberate the concentration/slave-labor camp at Nordhausen, Germany. April 11, 1945: Inmates at the Aschersleben, Germany, camp are evacuated by the SS to Theresienstadt, Czechoslovakia. April 12, 1945: U.S. Generals Dwight Eisenhower, George Patton, and Omar Bradley visit the camp at Ohrdruf, Germany, and view corpses and other evidence of Nazi atrocities. April 12, 1945: U.S. President Franklin Roosevelt dies. Vice-president Harry S. Truman becomes president. April 13, 1945: Soviet troops enter Vienna.